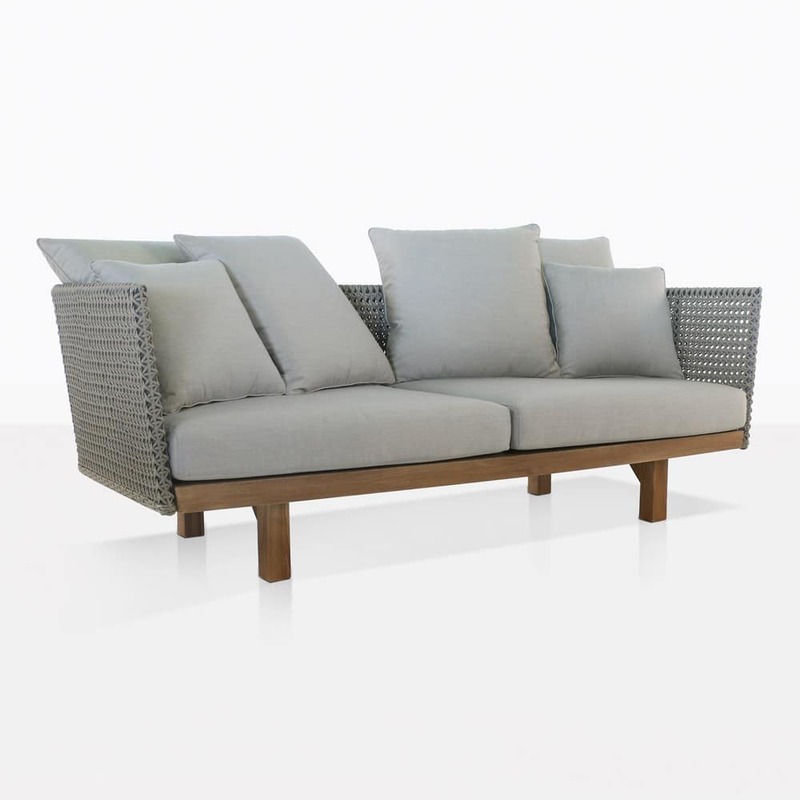 Step out to your outdoor living space and instantly feel like you are on vacation with the look and feel of the Brazil Deep Seating Sofa. The combination of woven high tech rope, the plush cushions and teak feet are a wonderful mix that says sunny days must be enjoyed in style! The rope is beautifully woven around the powder-coated aluminum frame. The base of the frame is made with a recycled teak platform. The Sunbrella® cushions are included as shown and make this sofa a dream to relax on. So mix up your favorite cocktail, grab your sunglasses and sit back and daydream away. The Brazil Sofa combines a stunning combination of materials that have amazing texture, colors and style. The attention to detail is evident and makes this sofa so fantastic and unique. Immediately feel like you are in an exotic location with a warm breeze drifting by. This sofa will go well in many spaces, and it is easy to accessorize with accent tables and decor. Visit our showroom to experience the amazing detail of the Brazil sofa for yourself. We are open 7 days a week and look forward to hearing from you. Don’t forget, we ship nationwide and everything always arrives fully assembled.